Approaches for New Professionals: Intelligence, Emotionally? There are moments when we realize information we came across years ago resonated with us so strongly that it has become a part of who we are and how we approach the world. I’m not stating that I’m a master of Emotional Intelligence (EI), not by any stretch of the imagination. But recently, as it has come up at so many job panels, career expos, and meetings with national recruiters, all while I’ve been exploring the core of my business, I’ve realized once again that EI is the backbone to great leadership. I encountered the work of Daniel Goleman more than a decade ago. And though I’ve followed his work, I haven’t formally studied Emotional Intelligence to the extent necessary. As I work with young professionals, seasoned managers, and entrepreneurs, it’s clear that the challenges we deal with in our professional lives could be solved by higher levels of Emotional Intelligence. 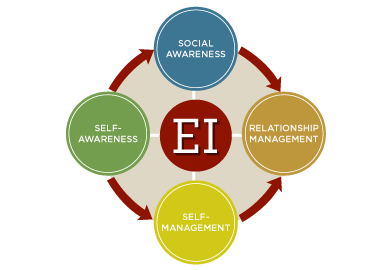 EI is not another leadership buzz word; it is at the heart of who we are as humans, how we interact with one another, and how we create sustainable organizations where people want to and will flourish. We each need this skill set.